Woohoo! I am so excited to update you all on the progress I have made in my closet. I cannot even begin to tell you how much better I feel after just one week! Now, keep in mind that I am not finished! And I am OK with that, because I have much progress to share and celebrate. The first thing I want to share with you is this. I know, it’s a disaster, right? But, the good news is that piles like this always mean that progress is underway! More good news is that those piles aren’t there anymore. In fact, they were only there for 1 day until I could get things off to the donation center. I feel so much lighter just seeing how much I was able to get rid of! And that isn’t even all of it. 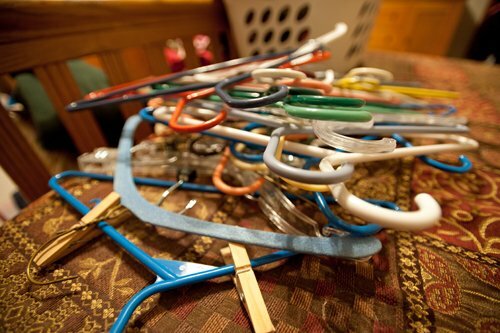 Take a look at this pile of hangers – further proof of my pruning. 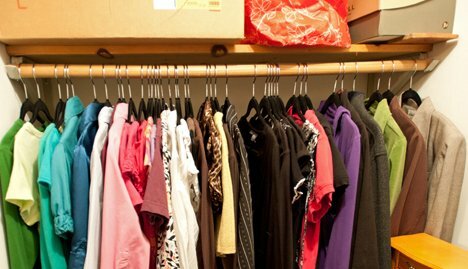 Before I began this process, I wondered just how much I was actually going to get rid of because I have learned how to prune my wardrobe on an ongoing basis, but Aby’s Organize Your Closet class process and worksheets have been amazing at helping me realize exactly what and how much I need. I have made some tough decisions, including getting rid of these items that I love, love, love. I came to terms with letting them go because they simply don’t fit my body, lifestyle or needs right now (and honestly never have.) I found dear sweet friends to provide good homes for them, and that actually made letting them go feel great. I like giving things to people I love! After I got down to just the clothes I am keeping, I swapped out all my mismatched hangers. And now, let’s take a look at my main clothing rack. Ahhhh, so much better! Along the way, it’s been awesome to have access to Aby when I run into stumbling blocks. Like right now, for example, I’m at a crossroads. I could do some simple, inexpensive things to make the space a lot more inspiring and functional. 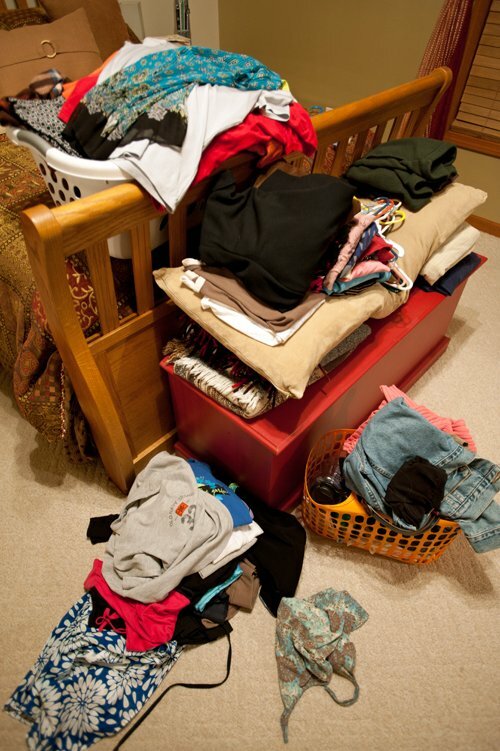 Or, I could opt for a new closet organizing system and really maximize the functionality. I have thoughts and ideas, as does my husband, but being able to access a professional organizer to help when I get stuck is just incredible. Tune in next week… hopefully I will have made a decision by then! And either way, I will most certainly have some great progress to report. Looks fantastic!! I love being able to give things to people I like too; it makes the parting easier. I totally need to weed out my closet (and accept my body). haha. Way to go Jennifer! Looks good! Can’t wait to see whatelse you come up with. Have a great weekend. Thanks, Emily and Dottie! You ladies have a lovely weekend. Jennifer, my congratulations on your closet – it looks great! And I am happy for you that you found a home for the items you love. It’s so much easier to let go of things when you know they will be treasured by someone you like and know and care about. I have downloaded the closet-self-paced-workshop a couple of months ago but haven’t gotten around to doing it, ahem… I am currently part of the goals-forum and in the middle of the habits-workshop, the closet-papers are on my 101-dreams-list, so I will do them before too long – looking forward to it, your results are quite an inspiration! 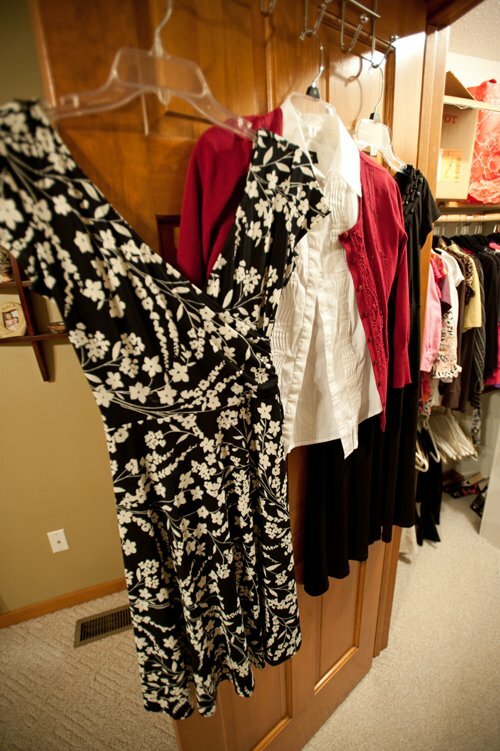 Loved seeing your closet transformation Jennifer ~ thanks for sharing. So excited for everyone taking part in this year’s workshop… it’s the best one I’ve done. Even now, nearly a year later, I still open my wardrobe (closet) and admire the results. The systems I put in place have made it so much easier to handle the challenges of moving from maternity to nursing wear as well as the seasons. I’ve also been able to deal with my baby’s growing wardrobe and surprisingly fast changes in size… I’m much quicker to clear out and pass on out of date/size clothes to make room for the new. Now if only I could manage my laundry as well as my wardrobe. Thanks Aby for creating the workshop!